Impetigo refers to a very localized bacterial infection of the skin. There are two types, bullous and epidemic. Impetigo is a skin infection that tends primarily to afflict children. Impetigo caused by the bacterium Staphylococcus aureus (also known as staph) affects children of all ages. Impetigo caused by the bacteria called group A streptococci (also known as strep) are most common in children ages two to five. The bacteria that cause impetigo are very contagious. They can be spread by a child from one part of his or her body to another by scratching or contact with a towel, clothing, or stuffed animal. These same methods can pass the bacteria on from one person to another. Impetigo tends to develop in areas of the skin that have already been damaged through some other mechanism (a cut or scrape, burn, insect bite, or vesicle from chickenpox ). About 10 percent of all skin problems in children are ultimately diagnosed as impetigo. Impetigo is a contagious bacterial skin infection that has affected the area around this patient's nose and mouth. The first sign of bullous impetigo is a large bump on the skin with a clear, fluid-filled top (a vesicle). The bump develops a scab-like, honey-colored crust. There is usually no redness or pain , although the area may be quite itchy. Ultimately, the skin in this area will become dry and flake away. Bullous impetigo is usually caused by staph bacteria. Epidemic impetigo can be caused by staph or strep bacteria and (as the name implies) is very easily passed among children. Certain factors, such as heat and humidity, crowded conditions, and poor hygiene increase the chance that this type of impetigo will spread rapidly among large groups of children. This type of impetigo involves the formation of a small vesicle surrounded by a circle of reddened skin. The vesicles appear first on the face and legs. When a child has several of these vesicles close together, they may spread to one another. The skin surface may become eaten away (ulcerated), leaving irritated pits. When there are many of these deep, pitting ulcers, with pus in the center and brownish-black scabs, the condition is called ecthyma. 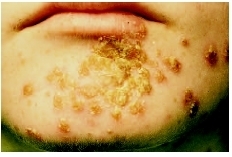 If left untreated, the type of bacteria causing this type of impetigo has the potential to cause a serious kidney disease (glomerulonephritis). Even when impetigo is initially caused by strep bacteria, the vesicles are frequently secondarily infected with staph bacteria. Impetigo is usually an uncomplicated skin condition. Left untreated, however, it may develop into a serious disease, including osteomyelitis (bone infection), septic arthritis (joint infection), or pneumonia . If large quantities of bacteria are present and begin circulating in the bloodstream, the child is in danger of developing an overwhelming systemic infection known as sepsis. Characteristic appearance of the skin is the usual method of diagnosis, although fluid from the vesicles can be cultured and then examined in an attempt to identify the causative bacteria. Uncomplicated impetigo is usually treated with a topical antibiotic cream called mupirocin. In more serious, widespread cases of impetigo, or when the child has a fever or swollen glands, antibiotics may be given by mouth or even through a needle placed in a vein (intravenously). Prognosis for a child with impetigo is excellent. The vast majority of children recover quickly, completely, and uneventfully. Prevention involves good hygiene. Hand washing; never sharing towels, clothing, or stuffed animals; and keeping fingernails well-trimmed are easy precautions to take to avoid spreading the infection from one person to another. Ulcer —A site of damage to the skin or mucous membrane that is characterized by the formation of pus, death of tissue, and is frequently accompanied by an inflammatory reaction. Vesicle —A bump on the skin filled with fluid. "Cutaneous Bacterial Infections." In Nelson Textbook of Pediatrics. Edited by Richard E. Behrman et al. Philadelphia: Saunders Company, 2004. Darmstadt, Gary L. "Cellulitis and Superficial Skin Infections." In Principles and Practice of Pediatric Infectious Diseases , 2nd ed. Edited by Sarah S. Long et al. St. Louis, MO: Elsevier, 2003. Sanfilippo, A. M. "Common bacterial skin infections." American Family Physician 66 (July 2002): 119–24. Stulberg, D. L. "Common pediatric and adolescent skin conditions." American Family Physician 16 (October 2003): 269–83. Wolfrey, J. "Pediatric exanthems." Clinical Family Practice 5 (September 2003): 55–7. I had a cold sore to start off with and then .. it was healing then i did a stupid thing and change what i was using .. it got so bad i couldnt speaka nd had to miss college to go to the hospital one look the doctor knew what i had... he said its very uncomon that i catch of get this because im 18.... I have 2 showers with out fail everyday even 3 if im doing sprts .. and i wash my hands all the time and have clean clothes and bed setting so how did i get it ..... I think it could have been when i went toa concert in Aberdeen to see My chemical romance itheir were so many people sweating on each other and very close/// and their were very young people their as well ... i want to find out how i got it because i feel sick witht he thought that im not a clean person !